Kate runs her ecomm business with her sister Sarah and they specialise in gifting for business, with a focus on beautiful, bespoke and artisan gifts. This makes their gifts unique and the products they use are truly special, and often very tasty indeed. In this podcast, we speak to Kate Fandry, director and owner of this Small Batch Gift Co. She's in partnership with her sister and they run a gifting businesses helping people and businesses give awesome small batch, handmade, locally produced gifts to their clients, friends, colleagues, and anyone lucky enough to be on the receiving end. Hello Kate Fandry from the Small Batch Gift Co and welcome along to The Cut’s podcast. It's great to have you on board as another Shopify merchant. Can you please say hello and introduce yourself and tell us a little bit about your business? Kate from The Small Batch Gift Co.
Yeah, thanks Ben. 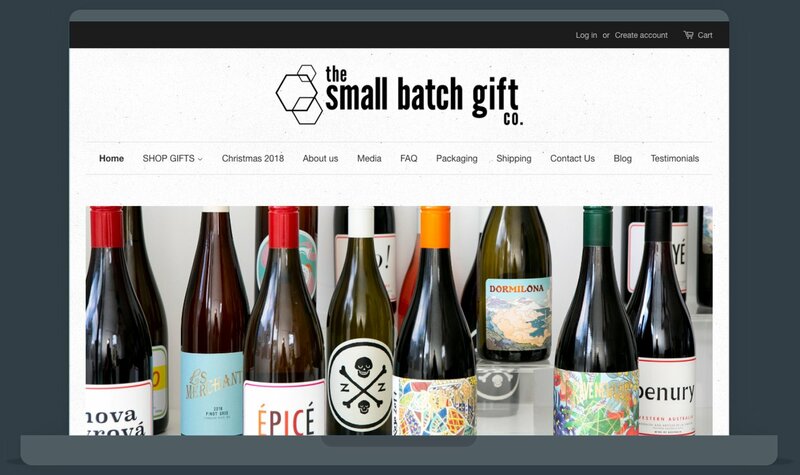 As you said, my name's Kate Fandry and I'm from The Small Batch Gift Co. We are a gifting service. We're based in Perth, but we can send our gifts anywhere in Australia and sometimes overseas. So we have an online Shopify store, which is obviously why I'm talking to you today. And our service essentially help other businesses with gifting. And everything that we stock is proudly made in Australia because we feel very strongly about supporting local makers and supporting the local economy. So that's what we do. That’s sort of the premise of your business, isn't it? It is, yes. We're about small batch gifts from premium quality suppliers. And you keep saying ‘we’, so let's talk about your partner in the business. Yes. So it is me and my sister Sarah Fandry. We’re joint directors in the business and we set it up together just over two years ago. I was just about to ask you how long have you had your business, can you tell us about the beginning of the business and the idea and what it was like sort of starting it up and kicking it off? Yeah. So, we always thought we might do something together, perhaps a business of some kind and we were looking for something that we were excited and passionate about, but also something that I suppose had a relatively low startup cost and wasn’t too scary to launch into because just of the position that we are in life, we've both got two young kids and Sarah was actually pregnant with her second child when we set the business up. So gifting seemed like a good fit. It's something that we'd always enjoyed doing together. Even as kids, we always loved choosing the right gift for our family and making it look beautiful, presenting it and seeing the joy that you can bring with a really carefully chosen and thoughtful gift. So it seemed like a good fit for a lots of different reasons. And that story with Shopify merchants who are busy young mothers, who have families at home and want to start a business that they can run from home is a really common one. So there's lots of lots of other people out there who will definitely be able to relate to your story and your position in life. So the inspiration around starting The Small Batch Gift Co was the idea or the enjoyment of giving gifts, was it? Yeah, definitely and I think we felt like when we looked at that time, so a couple of years ago when we looked at the other offerings around Australia and particularly here in WA, we just felt like the style, the presentation, the packaging of those other businesses sort of didn't match our taste. We thought if we feel like that there is a gap in terms of the way that the gifts are presented, there's typical products that people like to see. People like to see perhaps nice alcohol, people like nice chocolate. We were looking for something that we were passionate about, but also something that had a relatively low startup cost and wasn’t too scary to launch because of the position that we are in life, we've both got two young kids each. So let's talk about Shopify and your experience with that. How long have you guys been using Shopify for the business? Well, since since we took the concept of the business into actually launching a business, nearly from the beginning. So it's the only ecommerce platform that we've used. We didn't try anything else first, it was our first one. So that's been about two years. Okay, awesome. And what was your process like or how did you find and then choose Shopify? Online research basically. I didn't know anyone else that had an online store to ask, but I just did online research and then I did think of a contact who I used to know that had sort of experience and I had a quick chat to her on the phone and she said she thought it was a good fit for us. And so once you'd made that decision to go with Shopify, what was the first stage is like in terms of setting up your Shopify website for the Small Batch Gift Co and what was that like for you and your sister? Well, even though I'm a bit of a ‘tech dunce’, somehow I became the one. As I mentioned before, we were looking for pretty low startup costs and that was one of the things that attracted us to Shopify. Everything that I've researched, led me to believe that even tech dunces could make a website and a store. Did that prove to be true? It was true and I couldn't believe it. So the setting up and that initial dealings was amazing. I was really impressed. So, define amazing. What do you mean by ‘amazing’ in terms of that process? The support was fantastic. The online chat support that you can access anytime of day. I just found it so useful. Reassuring. There was always someone there I could talk to. Again, we've talked about the whole balancing young kids and so I tended to be doing it in the evening and I didn't even have to wait, you know, I could get straight in and chat to someone. They always seem to be in Ireland or Canada and they would just help me with all my questions and they didn't make me feel silly, it is just really great support. And then the whole choosing a theme and being able to place your imagery and your content, it was just really straightforward. That's fantastic and great to hear for sure. So can you remember your first sale and what that felt like? You surprised yourself and that must've been a really rewarding experience to do something that you felt out of your comfort zone. But then then you did it, you achieved it. Absolutely. And it took a lot of hours, but I was really proud. And then the first sale… I'm sure other Shopify merchants would have mentioned the very satisfying ‘Cha-Ching’ cash register noise. We get the ‘Cha-ching’ mentioned in just about every one of our podcasts. That noise is the perfect noise and people love to hear it at whatever time of the day or night. The ‘Cha-ching is okay. It's always welcome. And so your first ‘Cha-ching, can you remember that? Yeah I do. It was when we launched the store, the store went live on the 2nd of December and I think it was maybe a week or so later, so that was great. So let's talk a little bit about challenges that happened around it. The stress of running an ecommerce business. What are the biggest challenges that you've experienced in your business at The Small Batch Gift Co? Probably this similar ones to everyone I'd say just attracting the right customers. And I think the thing for us, and I guess we wouldn't be alone here, is that at the beginning you might not necessarily know who the right customers are. So that's an ongoing process as you deal with more customers and then you see who your best targeted to and who you on the service side of what you do is most helpful for. So that's defInitely one. And I think that's just like ongoing. There's always 10 different things that I'd like to change in the website to sort of make it more targeted and make sure that the messaging is right. How do you deal with the challenge of having a defined market and then reaching them? What are your strategies around that? Well, I think, you know, social media comes into it. I think blogs, we still have got some work to do there I would say. But do you profile your best people? Who are your best prospects? So do you understand what that individual might look like? Yes we've done some work around that. Because the strategising and actually documenting something and then giving yourself a set goal to work towards whether it be the people you're trying to reach or all the channels that you're going to use to reach them or the user experience that you deliver on the site. If you write them down and develop a plan for them and then you test and pursue that plan, it really helps give clean, clear goals and gives you a clear path to follow. Alright, so insights and advice, if you can give some or think about those next questions in terms of helping out your peers who might be running a Shopify site or an ecommerce business on another platform or thinking about starting up. In terms of your site, what are the best apps and plugins that you've implemented on the site? I think for us, I'm just making sure that our Shopify site talks to Xero was really important because then it just every sale that goes through the website pulls through all the data to Xero and you don't have to worry about that. That's not something that we did from the very beginning so it probably seems obvious to some people, but anyway, that was good. I'm sure you're not on a desert island and I think in many ways nothing is obvious or everything is obvious. It just depends on where you're at. But at the end of the day, everyone is starting from ground zero, right? Yeah. And then I think as well maybe sort of ground zero level, but just making sure that our sign up form through MailChimp, that everyone was going straight onto our subscriber list as well. So those emails or eDMs, are they a powerful channel for you to reach people? Definitely without a doubt. And we find that because people take the time to sign up, they have a genuine interest in what we're doing. We find that our open rates for our ads on a good day are above the general retail industry standards. So that's great. And I think as well we thought a lot about the signup form and should we offer a discount code and those sorts of questions, but I think the fact that we don't probably means that the people that sign up have got interest beyond just trying to save $10 or whatever. Yes. They're more authentic or more genuinely more genuinely engaged with what you're offering and doing. Yeah, that makes a lot of sense. And Xero I suppose adds value in terms of it removes manual processes and make sure all your reconciliations are completely integrated and seamless and the Mailchimp API allows you to implement really important direct marketing strategies to your community. Yeah. And then the other one that I have to mention as well, it's called Postcode Shipping Extension. And because this is the first experience that I've had with ecommerce or even just having my own business at all. I'm sure this sort of experience was like so nice. I was trying to find a way of essentially splitting every postcode in Australia into flat rate shipping because when we were trying to figure out how to do the post we decided to go with a particular company. It's actually a third party provider called Sandal because they could give us the best consistency. I mean, you sort of assess that when you launch a business that you might be sending quite a few things around and maybe to Melbourne, but then you have that question of well what if someone orders something in far north Queensland and then how much would the shipping be to them and all those sorts of things. So we decided to go with this third party courier called Sandal. And I essentially sent them two giant excel spreadsheets of postcodes whereby one set of postcodes was like tier one shipping and one set of postcodes was tier two shipping for different flat rates. And so then I was like, well, how do I like when people go into my website and they punch in their post code or the postcode for delivery, how am I going to know which one's which. Okay, you are talking about shipping and fulfilment. and these are often a challenge for people and choosing the right supplier and finding the highest value can be very challenging. So can you just tell me the name of that app again? Postcode Shipping Extension. This guy had this app and I contacted him and he was like super responsive by email and I just said, look, I think your app does what I need to do. But the problem is tech dunce has no idea. Like how do I know about these two big excel spreadsheets with every postcode in Australia? And he's like, oh, just send it to me and I'll do it all for you. Oh perfect! So like for, I think I paid $10 a month to use the app and this guy just did all the tech support for me. He couldn't have been nicer and I just thought what a nice experience. Totally. Yeah. that's great. And I think you're coining a new phrase here with ‘tech dunce’. I've never heard it put exactly that way before, but I can see it catching on. Well there you go. Then you heard it here first. Absolutely. And are you able to share two or three top insights for other ecommerce business people? I think the first one would be to try and review your website on a regular basis and it's very hard, especially if you've built the whole thing, your eyes are not fresh anymore because you've just looked at it 2 million times. So if you can't look at it with fresh eyes, get other people to look at it for you and really see what the experience is going to be like and how you see how easy it is to use..
And what else would be my next one? Probably just to say to people who are still thinking about it and worrying about what platform to use - Just use Shopify! Don't worry. Well there you go - You heard it first from Fandry! Honestly, I couldn't be happier with it. Like I said, I don't actually have anything to formally compare it to and I understand that different platforms offer other things if you're blogging or if you're doing this or doing that, but but for us Shopify has been great. Yeah. Awesome. We find that our open rates for our ads on a good day are above the general retail industry standards. So that's great. And if you could give your young Shopify self some advice today. What would that be? Way back in the beginning when you're starting up, if you could tell that person something that would save some of them some heartache, what might that look like? I think probably just not to be in too much of a rush. I think it's important and especially if you're trying to build it yourself, I think you have to give yourself some time. Like me, not experienced at that. I think just not putting too much time pressure on it would be my best advice. Okay. That's awesome. How long did it take you to build your site? From starting and to getting it live? What was your time frame? Around three months. I was always doing it in the evenings after the baby went to bed. There is a lot of work in any website, whether you do it yourself or an agency does it, it does take time and effort to get it done. I think taking your time and not rushing and making good decisions and spending time choosing a good theme in the beginning, all those are really important things. So you've touched on a few of those things already, marketing and traffic conversion, but what sort of marketing do you invest in? Exactly. But as long as it's the luck of the draw who happened to launch the same way as you. But , you know, I think like we've discussed already, the eDM is a good for us because that I'm tapping into people that are already interested in what we're doing. Because as we've evolved, we've identified that business to business gifting is predominantly where we see our value. I'm sure focusing more on Linkedin in terms of communication rather than just when we first started, it was Instagram. I guess as the social media platforms are always changing, you know, instagram's quite different now than what it was two years ago when we were first setting up. And for us, just a lot of actual face to face networking and getting out and meeting real people because at the end of the day you need to show them your products. And a lot of people will want to see them and feel and touch and smell and taste. Yeah, that's right. And also, I think a lot of people as well, if you're positioning yourself as saying, look, we can be the gifting service and the gifting expert for your business and for your brand, then that's a very personal relationship and they need to know you and trust you and meet you. Yeah, absolutely. That's completely understandable. And there's nothing wrong with that. A lot of Shopify merchants are on the ground with the bricks and mortar store or doing direct marketing as well. That's absolutely fine. Do you invest in any SEO or Adwords or anything on the site? Traffic drivers? No, we don’t. You guys are a small operation and I was well aware of that and that's fine. A lot of people are operating on that small startup level. So what's the key with your website, do you think, to retaining visitors and then converting them into buying something. What is central around that for you? I think the home page and it's something that I'm actually reviewing at the moment because it's coming up to two years that the site went live and I'm aware that new themes are available and we're in a different place in our business journey and our ecommerce journey. So I think the home page just has to be amazing and I'm sort of looking at things that allow you to have a little video on the home page because people just love video. I think that's just so important because otherwise you can see in the data that people have only stayed on your site for three seconds. You don't have long to grab their attention, and you want to grab them for as long as possible. So a change to at least homepage design is in the future for you guys. And talking about your metrics, obviously you're using the Shopify metrics and do you use Google Analytics as well, or do you pretty much limit it to the Shopify metrIcs? I'd like to get more into the Google Analytics and I've sort of touched on looking at that, but at the moment we rely on the Shopify metrics. I know there's a lot more out there, but with the number of hours that you've got to spend, you just have to prioritise. For sure. And the Shopify metrics themselves are incredibly powerful and probably not even scratching the surface with what you can do with them. It's interesting to see a lot of people are using a combination of Shopify and Google Analytics. So looking to the future for you guys and The Small Batch Gift Co, if you had three things that you really wished you could do with Shopify but you might not be able to do right now? What would they look like? Oh, well we might be completely happy and not have a Shopify wish list! Well, let's just put you down as a 100 percent satisfied Shopify merchant. You've got everything you need. Yeah, go on. Put me down as one of those. Okay. We'll check that box then. So what does the future look like for the business in the next 12 to 24 months? What are your expectations and plans and goals and where do you think you're going to be? Well, I think again, just drilling down further into that ideal customer is where we’re still just focusing our energies and just growing the business. I think with gifting it can be quite patchy because, Christmas is quite a big time and it is all seasonal. One of my aims is educating businesses on being more strategic with their gifting. I suppose having that personal relationship and people trusting your advice. But you know what I'm saying to people, why don't you gift at Christmas because 87% of other people were going to do it then? And if being a different sort of business is an important part of your brand, why not do your gifts on a different day? By patchy you mean that all of your activities concentrated into two or three peak periods of the time. The traditional gifting time. Yes and obviously it's nice to smooth that out for us, but more just saying to businesses if they've got a budget for gifting, like let's look at how we can make that have the most impact for them and be best aligned with their business and their brand. One hundred percent, that makes a lot of sense. I think if you're talking about getting a maximum impact from giving a gift, then if you're giving it an unusual, or at a particular time of year that has an alignment to what you're doing then it'll have more impact. Obviously everyone gifts at Christmas time so it can vanish in the crowd,. Definitely. And the other thing is that research shows that people really value gifts that are personal to them. So whether that's because it's their birthday or their anniversary of being involved with the business as a client, that kind of personal touch to gifts make them really powerful as well. Okay awesome. That’s great, that’s a really good idea. if you can work that into a strategy, I think a lot of businesses would see the value in that. So do you have any final thoughts for people or Shopify merchants or people looking at starting ecommerce sites? They might be in the process of starting up their first online store, have you got any final thoughts for those people who might be listening? I would just say I'm especially talking to the tech dunces. Just don't be afraid, just give it a go. There's really nothing to lose and I wouldn't shop around for too long, just get started, get going. Use the support and the chat and you'll be an online in no time. So the support and the help that you need with the little startup issues and glitches that is all there and easily accessible for people. Okay. Awesome. Well, thank you very much. Kate Fandry from the Small Batch Gift Co it has been really good talking to you on the podcast and we all wish you all the very, very best for the yeah. No worries. Thanks for the chat. We're doing these interviews all the time, so if you are a Shopify merchant and would like to be involved, just contact me, Ben De Jonge or any of our team at The Cut and we'll organise your 15 minutes of fame.